Suddenly, my diabetes – as I know it – has changed. I learned this when I saw what you see in this picture. I am thankful that the CGM alerted me to several PREDICTED LOWs before the actual LOW (my low threshold is set to 80 mg/dl), and after those repeated nags (despite a manually suspended basal), that I finally pulled out the meter. And that scared the crap out of me. I wasn’t too scared of the 48, but was scared that I didn’t feel a freakin’ thing. Previously, I’ve dipped into the 70s and even the 60s while being unaware of my hypoglycemia, but never the 40s. I felt perfectly fine. As if I could have gotten behind the wheel and driven to the grocery store (thankfully I didn’t), or stopped what I was doing to change my son’s wet diaper (I did). I didn’t hesitate to snap the photo in real-time (notice its not going back in the meter history) just before popping five glucose tabs. Nothing could slow me down. Nothing but my own self-restraint, that is. I felt absolutely NOTHING. Physically. Mentally, I felt bad about not feeling bad. And that feeling is terrifying. And I fear it could happen again. 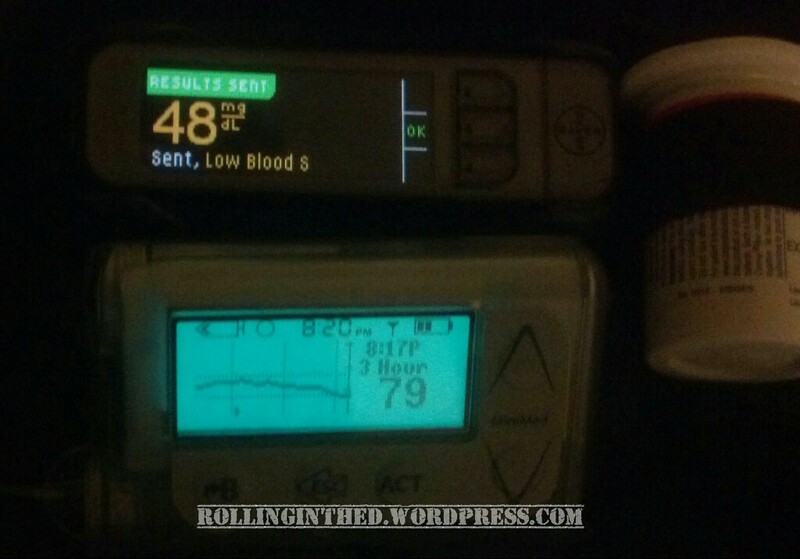 Posted on June 23, 2014, in Diabetes and tagged hypo unawareness, hypoglycemia. Bookmark the permalink. 4 Comments. Scott, I completely understand this feeling. I’ve started to use the “bad dream” template for these moments: I try to write down everything about what I’m experiencing (while treating), then go back and look at it later. In my case, I’ve realized that I am forgetting/ignoring some of the signs. Not saying your experience would be the same though. Although I do see isolated readings in the 30’s and 40’s, they are so much more rare than they used to be. I have my Dexcom alert set at 70 and most of my lows are caught in the low 70’s and 60’s. I’ve had the G4 for 1-1/2 years and have not needed assistance from my husband or anyone else since then. The G4 is not perfect but it’s so much better than my previous 7+ and Sofsensor. The only good thing about hypo-unawareness is that it’s easier to treat lows with the appropriate amount of food and not clear out the whole refrigerator…. I hope this experience won’t be repeated anytime soon for you. Hypo-unawareness is scary crap. I’ve woken up to some mid 20s only thinking, hmmm, I’m hungry. It always shocks my docs. But with the Dex, I find they are popping up less frequently. (And then I get scared when I don’t wear it.) That’s the part I hate. The fact that I’m now dependent on another device to tell me something I should be feeling anyway.